While perusing my mom's cookbooks today to figure out what to make for her birthday dinner, I ran across this humdinger of a pie book. 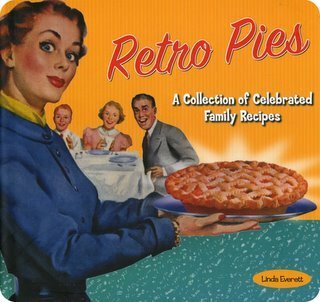 There are some killer recipes in it, as well as some pretty stellar pictures of pie-bakers back in the day. Thought I'd share some of them. 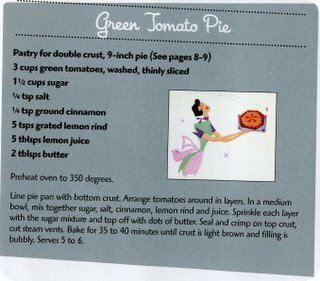 Here's a recipe for a green tomato pie (Em, is this how your dad makes his?) I've been wanting to try this for some time, but will have to wait until my first tomatoes show up this summer. Maggie Kate, maybe you'll be back by then? This one seems to strike a nice balance between sweet and tart. Toward the end of the book was this little recipe for a Buttermilk Sky Pie. I wonder how it would compare to the recipe posted earlier in this blog with its additional sugar and eggs...and its additional bit of sky? And for those of you out there who are struggling with your pie crusts, here's a little problem-solving clinic. 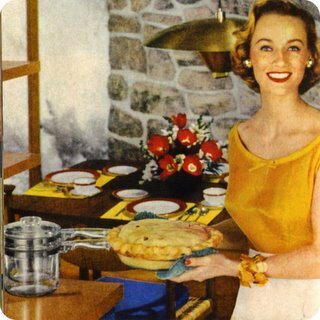 It may seem a little common sense, but who wouldn't want to refer to the pie crust clinic in all its glory?